Be the first to review this 2018 Subaru WRX. The Subaru WRX is a high-performance version of the Impreza compact sedan, made so with substantial engineering changes, not just bolt-on parts. The engine is more powerful, the chassis is stiffened, and it has its own all-wheel-drive system. Unlike the Impreza, the WRX is not available as a popular five-door hatchback. For 2018, the WRX gets bigger air intakes in front, and painted brake calipers. There is also a WRX STI model, that goes even farther, and makes fewer compromises for civility on the road. It has more features in the cabin, but the suspension is sharper and stiffer. It’s a bit faster, with an engine that is bigger and more powerful. Neither the WRX nor STI are known for refinement, comfort, or convenience. Road noise is high. They are considered five-seaters, but only two people will be comfortable in the rear because the middle seat is slim and hard. The rear seat folds down for more cargo space, but the Impreza Sport or Crosstrek are better able to carry sports equipment. Yet it was the Subaru Impreza WRX, along with the Mitsubishi Lancer Evo, that captured the imagination of enthusiasts through rallying, with performance coming from small but powerful engines, well-designed suspensions, and four-wheel drive. No one does this better than Subaru and the WRX makes the point. WRX, after all, is intended to stand for World Rally Championship. The WRX uses a turbocharged direct-injection 2.0-liter boxer four-cylinder engine with a twin-scroll turbocharger, making 268 horsepower and 258 pound-feet of torque that comes at 2000 rpm and lasts until 5200 rpm. It’s mated to either a 6-speed manual gearbox or a continuously variable transmission (CVT). The 6-speed manual uses all-wheel drive with viscous coupling at the center differential that splits power 50/50 front to rear, and is variable from side to side. The Subaru CVT is as sharp as any we’ve tested, thanks to its design and programming. It has eight steps that make it feel like a sequential automatic transmission in Sport Sharp mode, or six steps in Sport mode; it behaves more like a CVT in Intelligent mode. Its all-wheel-drive splits power 45/55 front/rear, and moves it from side to side depending on traction needs. Additionally, the torque moves around between wheels based on cornering forces and steering-wheel inputs. There’s electric power steering, and naturally the suspension is sport tuned. 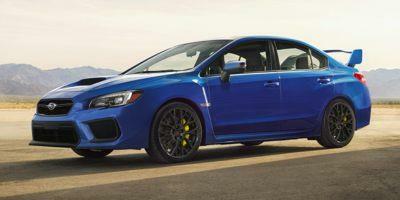 The WRX STI gets chassis bracing, a stiffer suspension with revised front geometry, 305-horsepower engine, its own 6-speed manual gearbox, bigger brakes, quick-ratio hydraulic-boost steering, and an edgy all-wheel-drive system that’s better for the track. With the standard transmission, the WRX gets an EPA-rated 20/27/23 mpg City/Highway/Combined; it’s 2 mpg less with the CVT, which is unusual because CVTs are all about fuel mileage. However, Subaru says in Intelligent mode the CVT delivers nearly 24 mpg Combined. The STI is rated at 17/23/19 mpg. The NHTSA hasn’t tested the WRX, but the IIHS give it its Top Safety Pick Plus rating, with the best scores across the board, including the difficult small overlap crash test. A rearview camera is standard. The 2018 Subaru WRX ($26,995) comes with manual transmission, steel wheels and base tires. WRX Premium ($29,295) and Limited ($31,595) offer the CVT as an option ($1200). Standard equipment on the WRX includes cloth upholstery, automatic climate control, 17-inch wheels, Bluetooth, heated side mirrors, a leather-wrapped shifter, a 5.9-inch driver information screen perched atop the dash, and a 6.2-inch touchscreen for infotainment including Apple CarPlay and Android Auto compatibility. Subaru’s camera-based EyeSight safety suite is available on the WRX with the CVT. It includes adaptive cruise control, automatic emergency braking, lane-departure warning, and lane-keep assist. The higher performance WRX STI ($36,095) is only available with a manual transmission. WRX STI Limited ($40,895) adds leather and faux-suede upholstery, dual-zone climate control, fuller center console, and LED headlamps with turn signals on the sideview mirrors. The big rear wing can be deleted. In the WRX, only the roof and trunk lid remain from the Impreza; every other body panel is unique, including grille and bumpers. The front fenders are pronounced, the front air dam deep, the air intakes massive, the hood scoop big, and the wheels bigger. Headlamps are LED. The STI is easily spotted by its giant wing on back. If that draws too much attention to the car, it can be ordered with a lower profile trunk spoiler like that on the WRX. The cabin is straightforward, fairly roomy for a compact car, and adequately but inexpensively finished. The instrument panel isn’t fancy, but it’s functionally well designed, with simple intuitive controls, and a cowl over the main gauges and another smaller one over the LCD display in the center of the dash. There’s matte silver trim on the soft-touch low-gloss black plastic dash. The WRX has grippy sport seats with fabric upholstery and manual adjustment, with leather and power optional. The STI gets pseudo-suede seats with big bolstering and Alcantara accents, as well as trim that’s a bit nicer. Realistically, only two passengers fit in the rear. Storage is better, with generous bins and trays, and 12 cubic feet in the trunk, about average for a compact sedan. The WRX is livable on the street, reasonably relaxed and comfortable on the street. It’s plenty fast. The turbocharged 2.0-liter boxer four engine, with 268 horsepower and 258 pound-feet of torque, is there when you need speed. It responds especially well because the torque is available from 2000 to 5200 rpm, thanks to the cams and valve springs. Because the cylinders are horizontally opposed, the engine is flatter and lower, dropping the center of gravity of the car and improving the balance, the key to Subaru’s good handling. It offers well-balanced cornering and precise electric power steering. The WRX likes transitions, and with its firm suspension and big stabilizer bars, it’s taut and composed. It’s got electronic torque vectoring, a system that applies the brakes on individual wheels to help the car turn into corners, and reduce understeer. The traction control can be disabled, if it feels intrusive during those most spirited driving times. The all-wheel drive system depends on the transmission. The CVT can’t be called a gearbox, because there are no gears, just pulleys and belts that simulate the behavior of gears. In Intelligent mode, it constantly alters its ratio to produce the best gas mileage. In Sport manual mode, the driver can paddle-shift through six ratios that feel like gears. In Sport Sharp mode, it responds like a sequential automatic or dual-clutch transmission, with eight virtual gears and swift throttle response. In this mode it can accelerate from zero to sixty in 5.9 seconds. The 6-speed manual gearbox offers fairly short throws. Its all-wheel drive uses a viscous-coupling center differential that splits torque 50/50, and moves it forward or back as traction demands. The setup is much quicker than the CVT, with zero to sixty times of 5.4 seconds. Weak point to the WRX is brakes. The 17-inch Dunlop SP Sport Maxx RT tires are willing, but the brakes in the two cars we drove felt numb and needed a heavy foot to slow the car down. The STI is another story. It’s clearly more powerful and corners harder, but it also rides with some rigidity. It’s sharper and stiffer. Its 2.5-liter turbo boxer four makes 37 more horsepower (305 hp) and 32 more foot-pounds of torque (290 ft-lb), but it’s not that much quicker in a straight line because of its gearing. Its 6-speed gearbox and all-wheel drive use a special driver-controlled central differential system, with a helical limited-slip front differential and a Torsen limited-slip rear differential. Its steering is quicker, with different front steering geometry and quick-ratio hydraulic steering. The brake issue is gone, with big Brembos front and rear. We can assume that Subaru buyers know that the WRX and STI are not the same as the everyday Impreza. They are proven and popular, not exactly cheap but well-priced for the power. They’ve been developed to the point where they’re both civilized, the WRX more than the STI. The cabins aren’t fancy, merely functional and without gimmicks. 2018 Subaru listings within 25 miles of your ZIP code. Find 2018 Subaru listings for sale near you.